SHOWINGS BEGIN MONDAY, APRIL 22ND. This beautifully renovated Classic Six is not to be missed. Enter through the gracious foyer into the sun-flooded living room facing south with open city views. 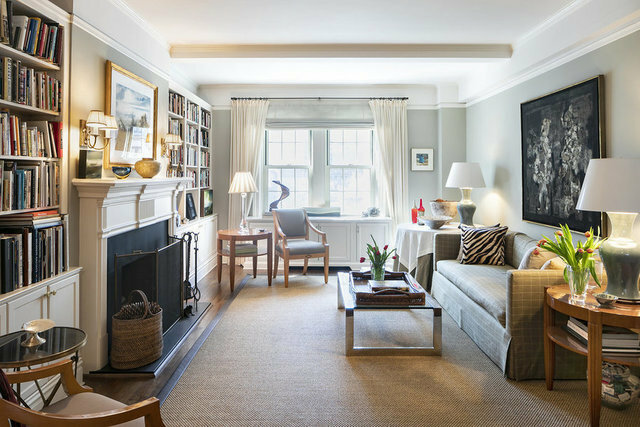 This elegant entertaining space boasts timeless pre-war details throughout which include lovely hardwood floors, high beamed ceilings, and a charming wood-burning fireplace. The master bedroom also faces south and is well proportioned with plentiful closet space and a tastefully renovated ensuite bath with marble fixtures and a walk-in glass shower. There is a second bedroom which has custom built-ins and access to a fully renovated bath off the bedroom hallway. The dining room has been converted into a den but can be used for many different functions, including a third bedroom. The ample sized eat-in kitchen has classic marble countertops, cherry wood cabinets, and top of the line appliances including a Bosch dishwasher, vented Viking stove, and a Sub-Zero fridge. A staff room, accessed off the kitchen, is outfitted with an Asko washer/dryer, wine cooler, and a full third bath. There is thru-wall a/c throughout the apartment. This full service building is right off Park Avenue and is located close to some of the city's best shops, restaurants, and transportation. Pets and pied-a-terres are allowed and a storage bin transfers with the apartment. There is a lovely roof deck. 50% financing allowed. 2% flip tax paid by the buyer.